Mimi Myers, RDH and Dr. Jared Mosley of Fresno, CA received the Orkos Award for professional excellence in a case study regarding minimally invasive treatment for a patient with severe periodontitis. Their 35-year old female patient had not been to a dentist for 20 years. The outcome was ‘WOW.’ We did a ton of high fiving. Mimi Myers, RDH and Dr. Jared Mosley of Fresno, CA received the Orkos Award for professional excellence in a case study regarding treatment for a patient with severe periodontitis. Their 35-year old female patient had not been to a dentist for 20 years. Significant build up of calculus on the patient’s teeth and very inflamed gum tissue that bled spontaneously made treatment especially challenging. At her initial appointment, the patient described intense pain and RDH Myers recorded fetid breath, loose teeth, extremely thick calculus, and swollen, discolored gums. A periodontal examination revealed that, when probed, her gums bled heavily 100% of the time and the pockets between her teeth and gums were measured at a depth of 6 to 7 millimeters. A healthy pocket depth is 3mm or less. The patient was diagnosed with severe periodontitis, as well as necrotizing ulcerative periodontitis, commonly know as trench mouth. Myers and Mosley recommended a non-invasive prescription tray delivery of medication as the first course of treatment to address the calculus build-up and inflammation and to gain the confidence of their fearful patient. 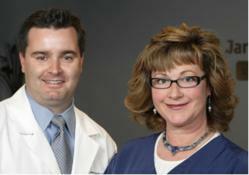 Treatment began with prescription Perio Trays® and medication on January 18, 2011. When the patient returned on February 8, after having worn her trays as prescribed, the calculus around her teeth was pitted and fractured, making it easier to remove. Her gum tissue was much less inflamed and her bad breath was mild. Scaling and root planning (a deep cleaning of tooth and root surfaces) was performed on the right side of the patient’s mouth. Because of the degraded condition of the calculus, the procedure took less time, was easier for Myers who preformed the procedure, and consequently was easier and more comfortable for the patient, who was instructed to continue using her prescription trays and medication until the next appointment. When the patient returned on April 4 to complete the cleaning on the other side of her mouth, Myers documented that the gum tissue on the right side, which had been treated daily with the tray delivery of medication and cleaned on February 8, was firm, a healthy color of pink, and reportedly pain free. Bleeding on the right side had reduced from 100% to only 3%. And, to the patient’s relief, the issue of bad breath was resolved. Gum disease, a chronic inflammatory response to bacteria, is in epidemic proportions in the United States. Eighty percent of the US adult population is afflicted with some form of the disease, ranging from mild gingivitis to severe periodontitis. The symptoms range from bleeding gums, to bad breath, to loose teeth. As the bacteria multiple and colonize in the mouth, they destroy the gum tissue and bone that support the teeth, causing teeth to become mobile and eventually fall out. Once an individual is diagnosed with gum disease, several treatment options are available, the majority of which are shunned for being invasive or at the very least uncomfortable. Generally the more acute or advanced the disease, the more invasive the recommended procedure. The most common in-office treatment for the disease is scaling and root planning (SRP), a rigorous cleaning of the teeth above and below the gum line that usually requires a local anesthetic and may require up to four dental appointments to complete. Severe cases may demand one or more surgical therapies, such as bone grafting, gum grafting, crown lengthening, bone and tissue regeneration, pocket reduction surgery, gingivectomy, or sinus floor augmentation procedures. When presented with invasive procedures such as these, some patients refuse to follow through with treatment, the most common excuses being fear of pain, financial concerns and the inconvenience of recuperation. The goal of all perio treatment options is to stop the progression of the disease. Unfortunately this cannot be achieved if patients fear the treatment more than they fear the consequences of the untreated disease. In 2004, Perio Protect introduced the Perio Tray® as a non-invasive adjunctive prescription device to place medication into periodontal pockets, the spaces between teeth and gum tissue where bacterial thrive. Dentists prescribe the custom fabricated Perio Tray® to fit precisely over the individual patient’s teeth and gums. Patients place prescribed medication into the Perio Trays® and wear them for a few minutes each day. The trays hold medication below the gum line for sufficient time for the medication to have significant therapeutic effect. The special design of the Perio Tray® is crucial to keep the medication from being quickly diluted and washed away by the natural flow of fluids in the mouth, known by dental professionals as crevicular flow. Once medication is able to successfully combat bacteria under the gums, the patient has a better chance to heal and the healthy results from treatment are easier to maintain. You can contact Dr. Mosley’s office by calling 559-224-6437. For additional information about the Orkos Award and the current winners, go to http://www.theorkosaward.com. 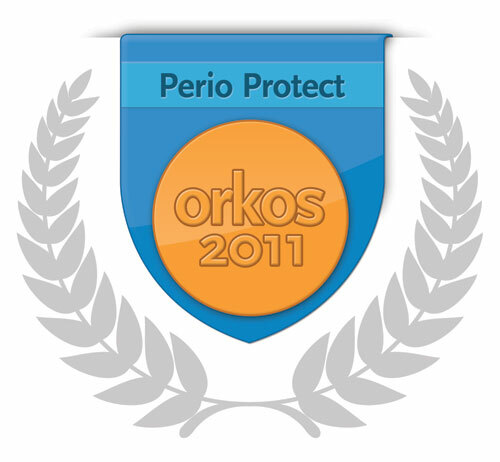 To learn more about the Perio Protect Method®, visit http://www.perioprotect.com or call 877-434-4867 (GUMS).